Flashback Summer continues as we revisit everyone’s favorite little sister. 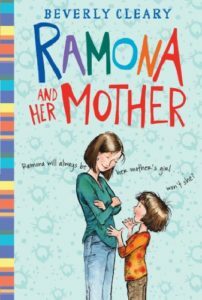 Becca and Katelyn joined us to discuss Beverly Cleary’s classic Ramona and Her Mother. Relive the thrill of squeezing out an entire tube of toothpaste and the tragedy of a bad haircut! Listen to this while making a tasty gelatine salad for your next dinner party. Candy Pairing: Becca says gummy bears, Kait says generic hard candy, Katelyn says dinner mints, Renata says Jello salad. Coming up next: Scary Stories To Tell in the Dark by Alvin Schwartz.